Audrey Caison Bridger died on February 2nd. She was the fourth daughter of the late Nellie and Claude Caison of Roseboro, NC. She was born on the 4th of July, 1930. She was educated in the Roseboro schools and was Salutatorian of her senior class. Mrs. Bridger graduated from Wake Forest College in Wake Forest, NC in 1952. She met Dewey H Bridger, Jr. while at Wake Forest and they were married on August 9th,1952. Audrey was active in civic concerns of Bladenboro where she lived. She was also active in the First Baptist Church of Bladenboro where she taught a Sunday school class of her contemporaries for many years and was the first woman elected to the Board of Deacons. 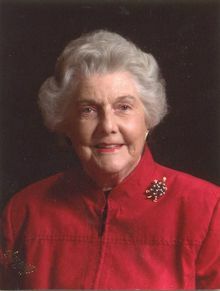 She is a former trustee of Campbell University and Docent of the Governor's Mansion. 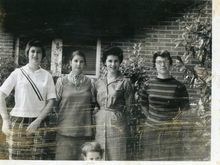 In addition to her husband, she is survived by three sons, Dr. Dewey H Bridger, III and wife Mary Ann, Claude Caison Bridger and wife, Cissie and Dickson Butler Bridger, and his wife Dorothy. She is also survived by six precious grandchildren; Audrey Bacot Dinchak (Jon), Stuart Bridger, Leslie Carse (Kyle), Caison Bridger, Butler Bridger and Ward Bridger; one sister, Nell Caison of Bradenton, Florida and two special nieces, Heidi Cannady and Lyn Jones. She is also survived by Ronald Gibson, formerly of Bladenboro, that she fondly referred to as her "4th son". Funeral arrangements have been made through Bladen Gaskins Funeral Home and the service is scheduled for Wednesday, February 6th at 11 AM. The service will be at First Baptist Church 500 South Main Street in Bladenboro and a reception will follow in the fellowship hall. In lieu of flowers, the family request contributions be made to First Baptist Church of Bladenboro P.O. Box 176 Bladenboro, NC 28320. May the God of tender mercies bring you peace during this difficult time. Dr. Bridger, Maryann & Family-- Our deepest sympathy for you during this time. Ms. Bridger was well loved, and will be greatly missed; she was a very special lady. A wonderful woman and loved her family. She will be missed by all.Thinking of the family. The family is in our thoughts and prayers. Mrs Bridget was a First Class Lady. Such a wonderful lady. I was so blessed to have her be such a big part of my life growing up on Charlotte St. Love to all of the family. We've known Audrey since we had to call her Mrs. Bridger. She always kept the Charlotte Street gang in line every summer and that woman could really turn a phrase. Our love and prayers go out to Dewey and the whole family. She was a great lady who will be missed. Gosh, what a sweet, beautiful lady. Her husband Dewey and I played many, many sets of tennis on the tennis courts on their back lawn. Always kind and gentle with a smile that could warm any heart. Dewey and sons . . . I will always remember your family fondly and extend my deepest sympathies during these times of grief. Love and prayers to you all . . . the Al (Junior) Hester family. Mr. Bridger, and sons of Mrs. Audrey, so sorry to hear of the death of your wife and the mother of her 3 sons. While I never new Mrs. Audrey personally, I know the sons and their wives as well as some of the grandchildren. I worked with Dickson for serval years and enjoyed his friendship. To each of you, just to let you know that you are in my prayers at this time. While your wife and mother will be missed here on earth, you have the assurance that you can see her again in heaven. May the God and father of Abraham be with you as we await the fulfillment of seeing Abraham offspring fill the earth like the stars in the heavens. Genesis 15:5,6. A kind and generous soul with a servant's heart with a laugh as bright and uplifting as sunshine! Truly one of God's saints. I am so thankful to have been among her wide circle of friends and so grateful to have witnessed her friendship with my Aunt Mildred. I pray God's comfort and grace for all her family. Thank you for sharing this lovely lady with us. Dickson and Dot. So sorry to hear of your loss. Don and I send our love, thoughts and prayers to all of the family. So sorry for your family's loss. I always thought Miss Audrey was a beautiful person inside and out. You are all in my thoughts and prayers. 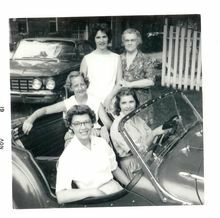 Aunt Audrey in her MG with Mother, Grandmama, Auntie Ruth and Aunt Heidi..... Will always remember..